A variable, as it’s name implies, can change over time. This variance allows us to do all sorts of fun things not just in the moment, but by projecting into the future, and looking back to the past. We’ll look at how we can use variables in the context of our digital switches to start. Code, as you may recall from last week, is a process of abstracting the computer’s language to a more human language. Abstracting this even further, we can break apart the computer’s process in our native tongue, then slowly transcribe this into code. There are a couple things that need to be done with variables to use them. First, you need to declare the data type (what kind is it? ), initialize it (what’s it called? does it have an initial value? ), then make changes (vary it). The kinds of variables we use in Arduino are probably going to be limited to boolean, byte, int, long, & char. More often than not, you’ll be using an int. This will hold most all the information you need. A bit is a 0 or 1. it’s the smallest unit of measurement in a computer. We string these together in a computer’s memory to make larger numbers. This binary notation (2 to the power of something) allows computers to store values larger than 0 or 1. The names can be anything that start with a letter and contain no spaces. They should be informative, and it’s usually helpful to camelHump them. Variables can also be used to name items like pins, so that you have easily identifiable names for things. Variables have scope, in that some are global, and available anywhere in your program, while others are local, and can only be seen by functions in which they are declared. Global variables are declared at the top of your program. Local variables are declared inside a function or loop. This far, we’ve worked with digital sensors, that is, things that are wither on or off. While this binary system is great for computers, we live in a world that’s not quite so black and white. The physical world exists along a spectrum, and, fortunately for us, there are a wide variety of sensors that can get information about the physical world. With some sleight of hand, we can teach computers about the world around us. We’ll address a few of the many different types of sensors in a little bit. First, how do we trick the computer? 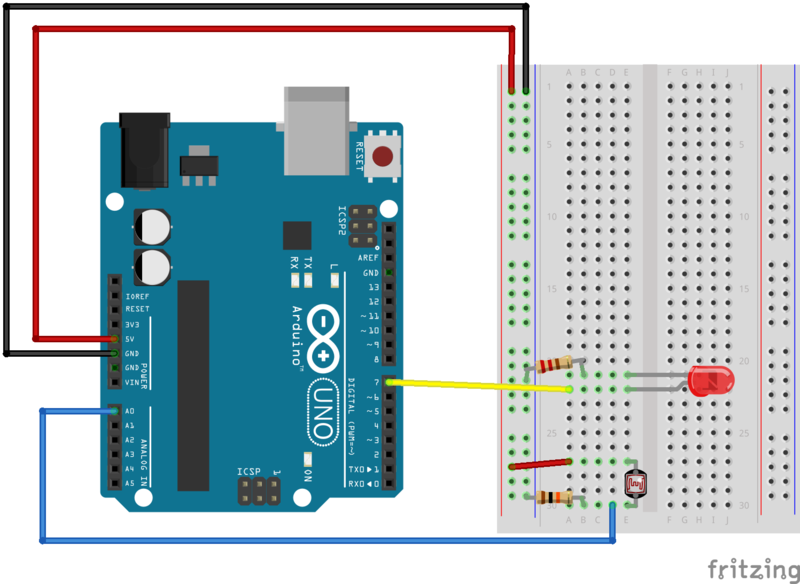 On your Arduino, there’s a special circuit called an ADC (an analog to digital converter). This samples the voltage on pins A0-A5, allowing us to translate voltage into a numeric representation. Different microcontrollers have different sampling resolutions. The Arduino has a 10-bit resolution. This means we can get a value between 0-1023 that represents the analog voltage on the pin (1024 total steps). 0 corresponds to 0 volts, 1023 corresponds to 5v. Lucky for us, this fits neatly inside an int. To get the value from a sensor, you call analogRead(). This takes one argument, the pin you wish to read the value from. Now that we have our code, let’s look at the circuit. The LED on pin 7 should be familiar from last week. Our sensor will be connected to pin A0. The easiest thing to get started with is a potentiometer. One the center pin acts as a wiper moving across the resistive material. The voltage coming off the center pin (the wiper) increases the further it moves away from pin A, where power is applied. 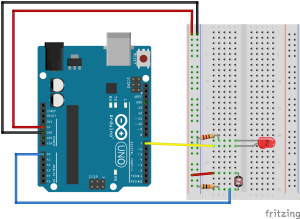 We measure the voltage of the center pin on the Arduino. Potentiometers are not polarized, so A&B are interchangeable. For other analog sensors (photocells, FSRs, flex sensors, etc. ), you need to build a small circuit with a pulldown resistor, just like with the switch. In this case, you’re building your own voltage divider. A general rule of thumb for selecting the proper resistor value is to match the maximum sensor resistance. If you aren’t sure, start with a 10k resistor and see what your output is like. To start sending information serially, you must include Serial.begin() in your setup(). It takes an argument that indicates how fast it will communicate with your computer. For the time being, use 9600. 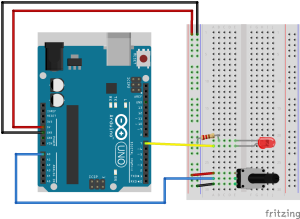 If you’re using a sensor that runs off of a voltage less than 5V, you will not get the full resolution of the sensor unless you call the analogReference() function and provide the Arduino with the appropriate reference voltage on the AREF pin.